Well you know, for our 4th pic-a-nic, people bring sides or desserts, as hot dogs and drinks are provided by the hosts. Since I've been on a baking kick, 710 suggested M&M cookies with red, white and blue candies. In theory that sounded fine, but believe it or not, I wasn't in a baking mood - and you really kind of have to be in 'a mood'. I wasn't in a cooking mood either, so I went for the least cooking thing I could think of - which was similar to last year. This year, I was much more pleased with the results (not that last year was bad or anything). No honey lime dressing this time. No avocado. No cayenne pepper. The recipe is easy-peasy. 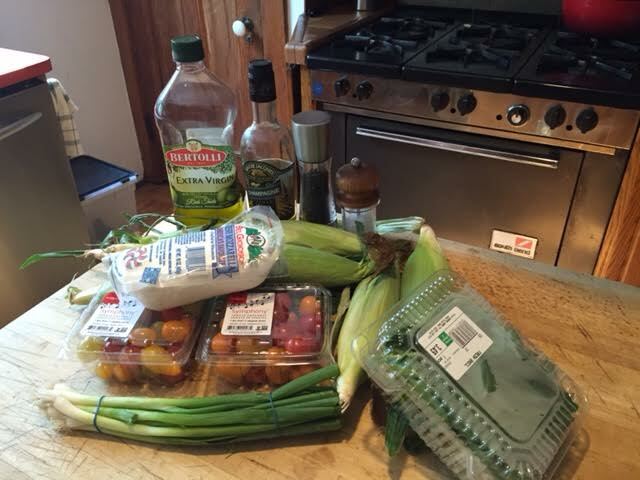 Shucking the corn and cooking is the longest thing. After that, you're golden. 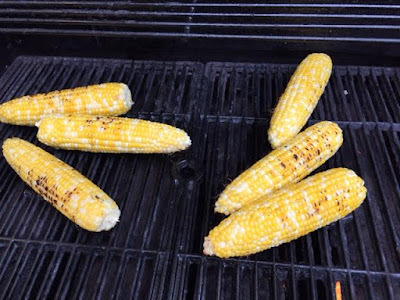 Grilling the corn. Or maize. 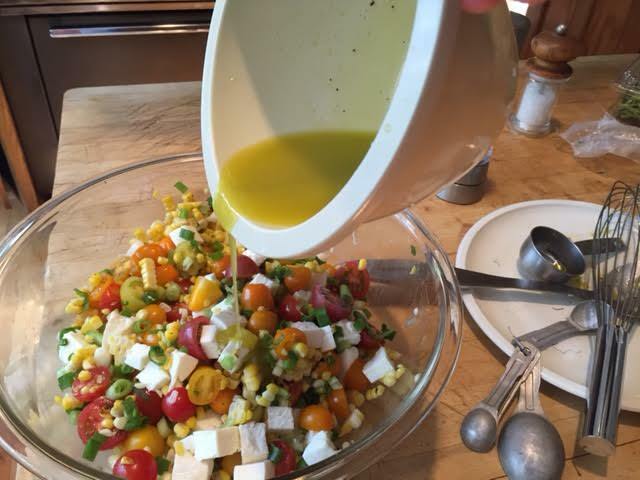 Place halved tomatoes into a bowl. 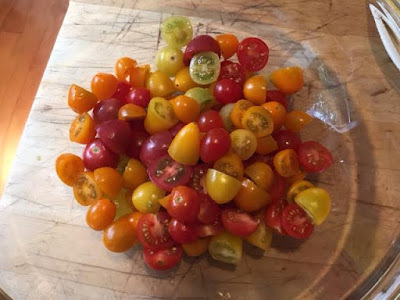 Last year it was two coloured tomatoes. This year it was three. 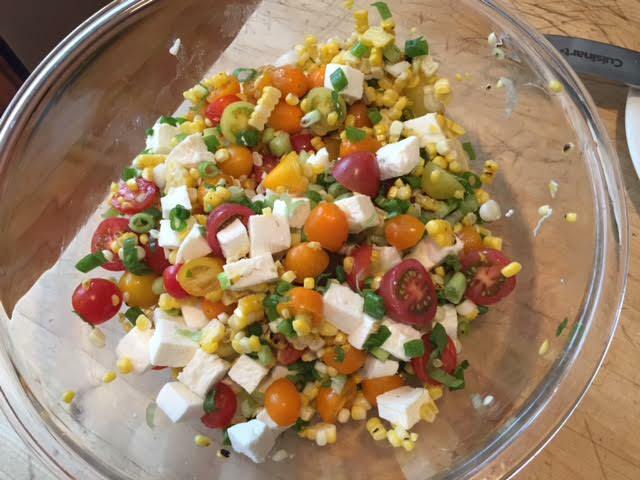 Add the scallions, Mozzarella and the corn you cut off the cob. In separate bowl, add vinegar, salt and pepper. 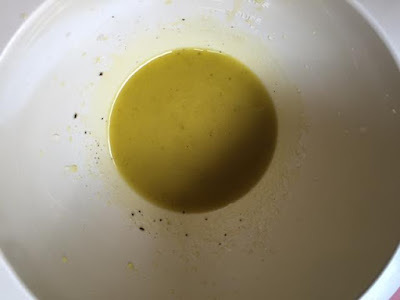 Slowly drizzle in olive oil as you continually whisk. Pour vinaigrette over the corn-tomato-scallion-cheese and mix well. Cover and let sit at least 15 minutes - or up to two hours. 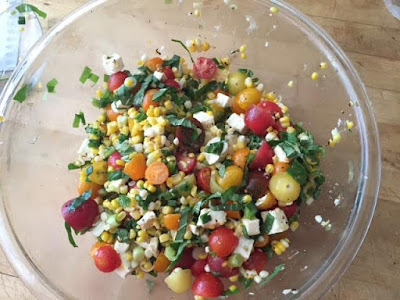 Before serving - add chopped basil and mix again. Actually, the fresh basil really makes this dish. It smelled and tasted so good with the other fresh ingredients. Like last year, this was a huge hit. It was literally all gone in 10 minutes - beating last year's time. As it turns out, so many people brought desserts, I'm glad we brought a side. I'm also glad we didn't store-buy it - as a few did. I'm not judging, but I liked doing it this way. yes, there IS such a thing as a "baking mood". That looks dee-lish; I'm'a hafta try it. And I'd be judging on the Store Bought People; hell yeah. That salad looks GOOD!! Fresh basil always makes a dish better.